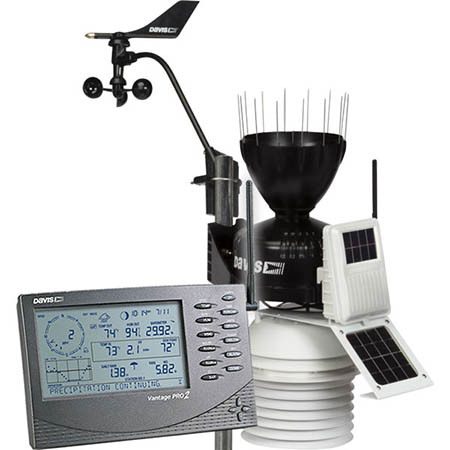 Davis Instruments 6153 – AYA Instruments, Inc.
Click here for a detailed comparison chart of Davis Vantage Weather Stations console features. 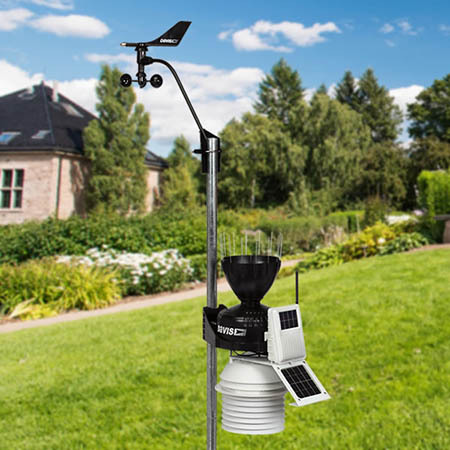 The wireless, rugged outdoor sensor suite runs on solar power. A lithium battery provides backup at night and during cloudy, winter days. The cabled version receives power from the base station. Includes additional radiation shield plates and a second solar power panel, which powers a motor-driven fan. Current inside and outside temperature, and for each of the last 24 hours. High and low temperature alarms. Current inside and outside humidity, and for each of the last 24 hours. High and low humidity alarms. Current and for each of the last 24 hours. Five position trend arrow shows whether pressure is rising, falling, or stable. High pressure warning for storm clearing (rising trend) and low pressure for storm warning (falling trend). Rainfall for the last 15 minutes and the last 24 hours, 24 days, 24 months, and 24 years. Flash flood and 24 hour rain alarms. Rain gauge uses tipping bucket (self-emptying) technology. Current and for each of the last 24 hours. 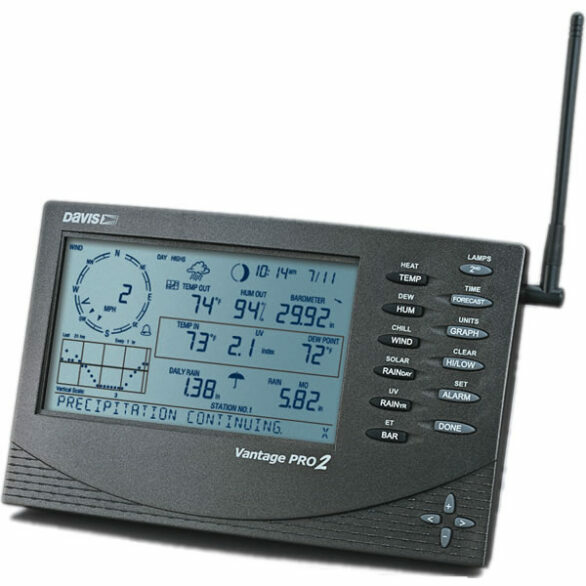 Rain rate alarm. Rainfall for the last 24 storms, with beginning and ending dates for each storm. Rain storm warning and alarm. Current wind speed. Average for the last ten minutes and each of the last 24 hours. High and average wind speed alarms. Current and for the last 24 hours, 24 days, and 24 months. Direction of high wind speed. Current wind chill. Wind chill alarm. Current and for each of the last 24 hours. High and low dew point alarms. Current and for each of the last 24 hours. Heat index alarm. For most weather variables, with time and/or date, for each of the last 24 hours. Time of sunrise/sunset and moon phase at your location - it even takes daylight savings time into account! Graph current conditions, averages, or highs and lows for the last 24 hours, days, months, or years. 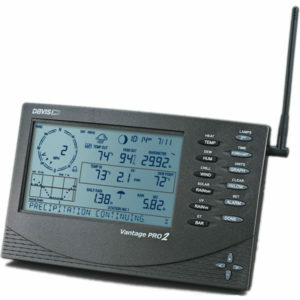 The Vantage Pro2 forecast icons show sun, part sun, clouds, and rain, or snow. You may also check the scrolling ticker-tape at the bottom of the display for more details. 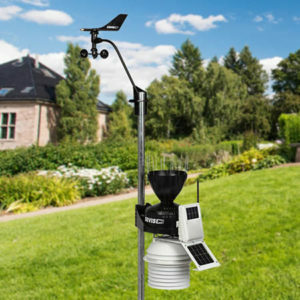 Ultraviolet (UV), solar radiation, soil moisture, soil temperature, and more.